Icons are loved; Icons are revered; Icons are Fantastic! 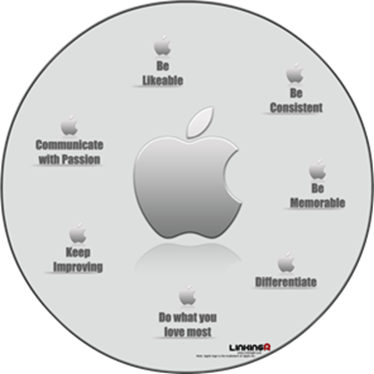 What if I tell you it doesn’t take much to be an Icon-The Apple of your Industry’s Eye! (Pun, intended) All you need is what Steve Jobs had when he brought Apple back (thanks to the brilliance of Ken Segall) from the brink of bankruptcy – Passion & Vision. If Life is a Canvas, Passion adds color to it! Every Individual’s life is a unique portrait of passions that add vitality & vigor to an otherwise monochromatic existence. Passion when channeled with a Vision empowers an Individual to build a legacy, larger than life, that inspires the world to come! If every Individual decides to follow his Passion, and transform his Vision into a reality; we would have a league of truly ICONIC Individuals like Jobs who can create History! There are Icons & there are ICONS; Legendary ICONS leverage on the power of Personal Branding to create Fantastic Experiences for their Audience that touch hearts & inspire lives. To catapult Your Brand into the league of such ICONIC Individuals, I present you with the concept of BrandtasticTM– Fantastic Brand Experiences: Building an ICONIC Personal Brand that manifests the power of Fantastic Experiences for the Community, time after time. The SOUL of Your Brand is the essence of Your Brand that distinguishes you from the herd. For Apple, its Innovation; For Volvo its Safety; For Richard Branson its Adventure; For Oprah its Compassion. Go ahead and Discover what is the SOUL of Your Brand that makes you one in a million! Once you’ve discovered it, now religiously incorporate it into every aspect of your Personal Brand and bring your Brand to Life. A consistent Brand Communication & Expression builds an alluring Brand Voice and a steadfast Brand Reputation. Excite them online & Enchant them offline, is my motto! You are your Brand in Action- Conceive a Signature Look and Feel that is pulsating with the SOUL of Your Brand. A Personal Tip: Have a Signature Greeting & Sign off when on Podium; introduce them to an ICONIC Brand & Sign out with an Inspiring Brand Experience. Make people WANT to work with you, and only YOU. Offer them an indispensible rational value proposition and garnish it with an irresistible emotional value proposition-in terms of what ONLY you can do for them. Personal Branding can indeed be a daunting task if you keep working on creating a decorated image of yourself; hence prima facie, Personal Branding is often viewed with unwarranted skepticism. The beauty of Life lies in its Simplicity; and the beauty of Personal Branding lies in the Simplicity of Being Yourself, all along. These are my 5 Golden rules for creating Brandtastic Experiences for your audience; I would love to hear your side of the story, on how you offer Brandtastic Experiences. In the meanwhile, remember to Be Yourself; Be Awesome; Be Brandtastic!